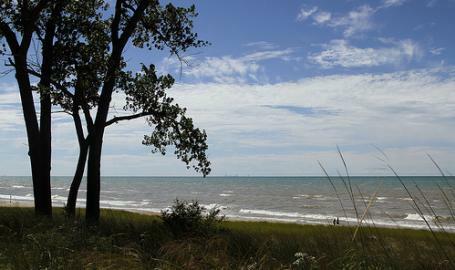 Part of the Indiana Dunes National Park. Swimming permitted, no lifeguards on duty. 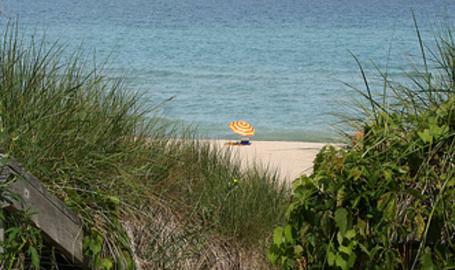 Swim at your own risk, as rip currents and waves can make swimming hazardous. Picnic at this area that overlooks the lake. Amenities: Parking for cars, information board listing current park activities, drinking fountain, restrooms, picnic tables and shelters. 1. Starting at Interstate 94 and Indiana 49, go north about 3 miles to U.S. Highway 12. 2. The exit to U.S. Highway 12 is on the left. 3. Turn right (east) and go 5 miles on U.S. 12 to the stop light at Broadway. 4. Turn left (north) and go till the road ends 5. Turn left on Lake Front Drive, then park on the left facing the lake.